A unique, once-in-a-lifetime opportunity exists for the citizens of Manitoba to reclaim the birthplace of their province. For almost 50 years, Upper Fort Garry, at the intersection of the Red and Assiniboine Rivers, was the centre for commerce, law and political governance. A building owned by the City of Winnipeg at 100 Main Street, situated on the original site of Upper Fort Garry, has been declared surplus property and the City has issued an invitation for Expressions of Interest for it. “Friends of Upper Fort Garry” consists of 37 prominent citizens who are concerned about the future of the site. This volunteer group has been formed to persuade the city to declare the land a heritage park (zoned PR 1) and is proposing a heritage and cultural development for the site. If the site is sold to commercial interests, it is unlikely that the opportunity to recognize the birthplace of Winnipeg and Manitoba will ever occur again. 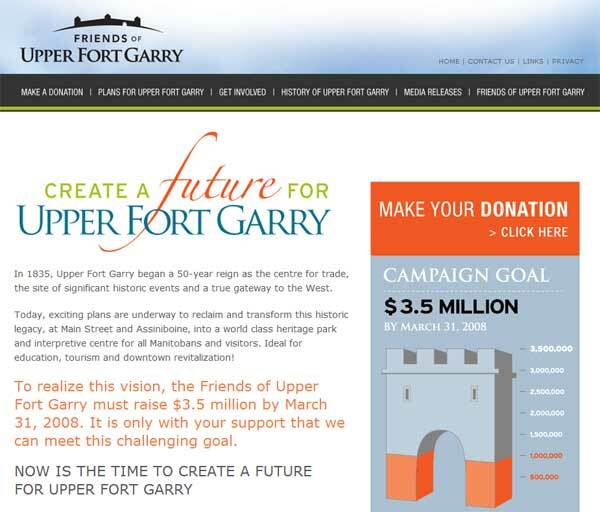 For more information on the “Friends of Upper Fort Garry” initiative, see their web site www.upperfortgarry.com.